The Fire Mage DPS Guide, Watch Them Burn! Warlords, like all expansions and most big patches changes things up for mages, but not in a huge way. You get ten more levels, a new talent row, some perks, you’ve lost a few abilities and gained a couple others. All in all Fire is in good shape in Warlords of Draenor 6.2, you didn’t even have to change your rotation. 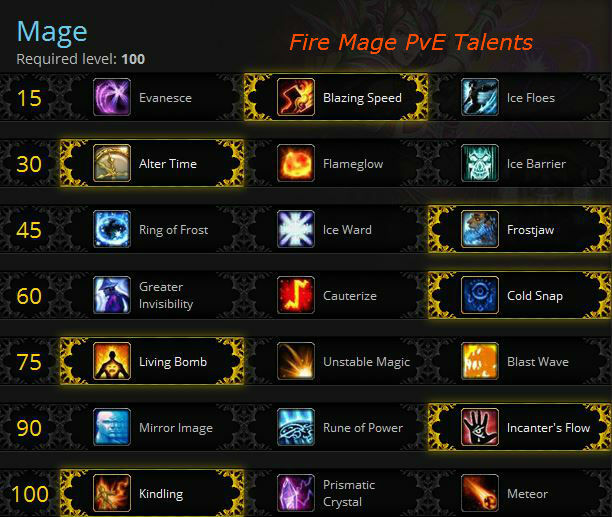 This Fire Mage guide is primarily intended for use at level 100. However, the principals will still apply during the leveling process. If you’re looking for advice on leveling your Mage, check out our Mage Leveling Guide. If you want the same in-game step by step leveling guide that we use to get to level 100 as fast as possible, take a look at our favorite, updated for Warlords, in-game leveling guide. There have been a few talent changes in Warlords, plus some talents are only available to you and not the other specs (and the reverse is also true.) At certain times you might value one talent over another. Keep a stack of Tome of the Clear Mind handy for easy talent switches. All of these are good, your pick depends on what you need at any given time. Avoidance: Evanesce is nice for emergencies. Fade away and, briefly, avoid all attacks. It replaces your Ice Block and is on a much shorter (45 sec) cooldown. Nice for fights where you have to avoid large (area or direct) incoming damage. If that’s what you’re facing then this is your #1 pick. Note that it does not wipe existing effects, such as a DOT, which Ice Block does. Movement: Blazing Speed is useful for those times where you need a quick dash. It’ll also get you out of slowing effects, saving your Blink. Move and Cast: Ice Floes for when you really need to cast spells while on the move (which can happen often enough.) Definitely has more DPS value than the others. Which one depends one how often damage is coming in and what type it is. Big “heal:” Alter Time lets you replay the last ten seconds, possibly “healing” than massive damage you just took, by returning you to the “time” and place you were when you cast it ten seconds ago. Or sooner if you recast it sooner. No longer lets you replay your buffs and procs. It’s simply for moving back to where you were and avoiding that big hit you just took (or will take in just a moment.) You can also use it to reposition yourself, if you had to move away and have a need to return. Dmg reduction: Flameglow constantly mitigates some damage. It’s a great choice for fights where you anticipate taking constant damage. It won’t make you a tank, but it will make the healer’s (and your) lives a bit easier. It’s also one less button to think about. If you’re taking constant low level damage it’ll probably block more than your shield, ever the duration of the fight. Shield: Ice Barrier is the “fire and forget” shield. Put it up and forget about it for a minute. Blocks a fair amount of damage. Especially useful in fights where you are suffering from “pushback” or you know there’s a big chunk of damage coming in. As this tier is composed solely of CC, take whichever appeals to you most/suits an encounter best. Ring: Ring of Frost is an AoE CC. Freeze several opponents and then burn them. Nice for patrols or to grab a group. Takes 2 seconds to cast or arm. Can block passageways. Melee: Ice Ward is pretty useless in most raiding situations. In other situations where you have to kite something then it’s pretty nice. Frost Nova will be cast regardless of whether you take the Blast Wave talent. Silence! : Frostjaw is a very nice single target CC/Silence. Use it on that incoming add or tough trash mob casting away. If you need to freeze groups then take Ring of Frost. As it’s your only silence these days you might find some use for it against caster trash. Two nice ways to avoid damage and one that might add a bit to your DPS. Avoidance: Greater Invisibility is an interesting choice for survivability. It removes effects, massively reduces damage, and drops threat, so can be very nice in bad situations, esp. if you know what’s happening before it happens. 1.5 min cooldown. A bit redundant with Evanesce, but useful. Avoid Death: Cauterize lets you avoid death, but also sets you on fire, which is actually a much better tradeoff than it might sound. Ice Block removes the burning and Evanesce avoids some of it, assuming your healers don’t instantly get to you. Some put this into an “I’m Cauterizing, Heal me please!” macro and let a healer take care of the damage. Reset: Cold Snap is the only one that can add to your DPS, by resetting cooldowns, and the additional Ice Block, Dragon’s Breath, and the Heal can help survive in some bad situations. All of these have their uses. If you’re using the Meteor talent then Blast Wave and Unstable Magic are equal in overall DPS, though the latter is passive, so is one less key to play with. If you’re using Prismatic Crystal then it’s Blast Wave all the way. If it’s Kindling then use Living Bomb. DOT: Living Bomb is best for groups and decent for single targets. It burns the target for 12 seconds and it then explodes and damages the target and nearby mobs. Passive: Unstable Magic causes your Fireball to have a chance to explode on impact, doing extra damage to your target and also to any nearby enemies. Does a bit less overall damage than the others, but it’s also one less item on your bar. Nice for singles or for groups. Boom: Blast Wave is your hardest hitting shot. Two charges. Blasts the target for solid damage and the wave blasts all targets nearby for partial damage and also slows them. It comes with two charges so you can fire a pair back to back, right at the peak of your Incanter’s flow or with the Prism. It will be 25 seconds before the next one is up. Burst: Mirror Image – Create three copies of yourself which start blasting away at the target. Massively buffed from its pre-WoD form, especially handy in long fights where you can use it more than once. A nice “burst” cooldown. Rune: Rune of Power is the simplest to use of this tier, seeing as all you have to do is stand in it. Best used on fights with little or no movement. Place the rune(s) and blast away. This is the choice if you’re able to stay in one place. If you are not, and you often aren’t, then go with one of the others. Runes last three minutes anc you can place two. Passive: Incanter’s Flow is best used on fights with plenty of movement. It’s a passive ability and causes your boost to ebb and flow, from a minimum 4% boost to a 20% max, cycling from peak to peak over ten seconds. Try to line up Pyroblast! procs with the peak flow. This averages out to a 12% damage increase over the entire fight, which isn’t bad. Cooldown: Kindling: Crits from Fireball, Pyroblast, and Inferno Blast reduce your Combustion cooldown by 1 second each. And easy talent to use if you don’t want more buttons. Less DPS than the others. Have two charges of Blastwave ready, have Pyro! & Heating Up procs ready, fire any “on use” buffs (such as your Int potion,) then drop the crystal and fire away. Orbital Bombardment: Meteor: Drops a fraggin’ meteor!! Easier to use than the Crystal. Best area attack. Does damage to an 8 yard radius, also burning the ground doing continuous damage to all who remain in the fire. 3 seconds delay from cast to impact so make sure your targets are stationary when you call for the bombardment. Glyphs are easily changed, one at a time, with a Tome of the Clear Mind. Swap ’em as necessary for different fights or to better suit your game. Glyph of Combustion – More burnination on a longer CD. Increases the duration of your combustion. Glyph of Counterspell – can use Counterspell while using other spells (eg: Fireball) if you need that interrupt right now. Glyph of Inferno Blast – Spreads your DoTs to an additional target. Glyph of Blink increases the range of your Blink. Glyph of Ice Block causes Frost Nova to be automatically cast, at no Mana cost, when Ice Block ends. Frost Nova will be cast regardless of whether you have the Blast Wave talent. When your Ice Block ends you are also granted a 3-second immunity against all spells , but not to physical damage, which is still a pretty nice immunity. Cauterize, Ice Block to kill the DOT, cancel Ice Block, get three seconds spell immunity. Sweet. On “Interupt Duty?” Glyph of Counterspell – Cast Counterspell while moving or casting other spells, but the cooldown is increased by 4 seconds, to 28 seconds. Minor glyphs are generally just cosmetic, though a few have minor utility. Glyph of Momentum – Let’s you blink in the direction you’re moving rather than facing. Nice for strafing. In Short: Int >= Crit > Mastery. There are no other stats for Fire Mages. In Warlords Hit, Expertise, and Reforging are all dead. You will now hit most things all the time, with the exception of the Boss having a small chance to dodge. You cannot reduce that chance. You also have two new stats, Multistrike and Versatility. You might also see various tertiary stats. Int increases your spell power. Generally there will be no competition between Int and Crit, or any other stat. You won’t have to decide “Int or Crit…?” for any item, such as gemming. This is good, for while Int is your best stat there are times when Crit might be, or is, better. Crit: You have one big reason to pile up the Crit: Pyroblast! procs. That’s where a lot of your damage will come from. Crit’s actually pretty close to Int in value, when you have the tier 18 4 piece set bonus then it exceeds Int in value. 2 piece Set: Pyroblast has a 25% chance to conjure a Fiery Phoenix, dealing Fire damage to the target. 4 piece Set: When the phoenix is summoned, you gain 6% spell damage and 6% spell haste for 15 sec. Mastery: Your target burns, damage over time, from all of your various fire attacks, including Multistrikes, so it’s a solid damage add. The more fire you can lay down on the target the more damage you’ll get from Ignite. Your Combustion copies your Ignite, so the bigger your Ignite the bigger your Combustion DOT. Haste is nice, but a lot of your damage comes from those Pyro! procs, so Crit is better. Still, Haste does reduce cooldown and cast times and increases how quickly your DOTs tick. Multistrike gives you a chance to fire off one or two additional strikes at 30% effectiveness. See here for how Multistrike works. Versatility adds to your offensive damage and your defense. It’s a straight up damage add, but does not add nearly enough to be interesting and you don’t need the defense enough to consider it. If you still need to get leveled to 100, go here. The NeedToKnow addon from Curse will help you track your ignites and such. Molten Armor should be active at all times along with Arcane Brilliance. Focus Augment Rune: +50 Int for one hour. Your primary attack spell is Fireball, though Scorch can be used if you need to be moving. Heating Up (HU) is triggered by critical strikes with any of the following spells: Fireball, Pyroblast, Frostfire Bolt, Scorch and the guaranteed critical Inferno Blast. Use IB right after you get an HU proc. Whenever you have a Heating Up proc cast Inferno Blast if possible for the guaranteed critical effect and therefore the automatic trigger of Pyroblast!. Cast Pyroblast whenever Pyroblast! triggers. The ideal time to use Combustion is after a critical hit with either Pyroblast or Fireball for maximum effect as the damage of Combustion is increased by the damage of the DoT effect caused by Pyroblast and Ignite. Combining trinkets and other forms of damage increase prior to triggering a Combustion will optimize your damage output. Use Inferno Blast right after Combustion to spread that Combustion DOT to up to three adjacent targets. Ideally you’ll have both Ignite and the Pyroblast DoT effects active on a target before using Combustion. Bomb, and refresh just before it expires. Alter time on Pyro! Procs or right before an important buff expires. Use Inferno Blast when Heating Up procs to get a Pyro! proc. Inferno Blast to spread dots. Add Blizzard, Arcane Explosion, or glyphed Cone of Cold, depending on position. Presense of Mind to insta cast Pyroblast or other cast-time spell. This works best with a single target as the Crystal’s damage is shared among all targets. A sngle target will take 130% total damage. drop the crystal and unload everything. Combustion, 45 seconds (1.5 min if glyphed,) Takes the Ignite DoT on a target and creates a new, additional 10 second DoT. Resets Inferno Blast, so use IB right after Combustion to spread effects. Alter Time, 1.5 min, Returns you exactly as you were when recast or after 10 seconds, but does not replay any buffs. It resets your position and your health. Mirror Image, (if you took this instead of Incanter’s Flow) 2 min, dumps aggro and increases DPS. Images inherit crit, haste, and any spellpower that you have. .
Time Warp, 5 min, The mage version of Bloodlust/Heroism and the Core Hound’s Ancient Hysteria. Duplicates them, but does not stack with them. Coordinate with anyone else in your group who has a similar ability. Ice Block, 5 min, Emergency damage mitigation. Ice Block will make you immune to all damage for 10 sec. Invisibility, 5 min, Another aggro dump, but takes a bit to fully activate. Greater Invisibility is instant and has a 1.5 min CD. Polymorph, 1.7 sec. cast, turns the target into a critter. If glyphed then DOTs will be removed, allowing it to stick. Breaks on damage. Level 90 or less? Gem either Crit or hybrid Int/Crit gems. Gem sockets are actually few and far between. They have a random chance to appear on Raid gear. Also, there are no meta gems or sockets, there are no socket bonuses, and all sockets are “prismatic,” which means that they will take any available gem. Older (Mists of Pandaria) gems work until item level 600, but the item squish cut them down a bit. What used to be 160 Int is now 10, for example. The new Prismatic gems are 35/50/75 points of Mastery or whatever. It’s roughly 100 points to get +1% crit, so if you can’t afford the top gems don’t worry about it much. You won’t gimp yourself by dropping down a step or two. Mists of Pandaria (and earlier) Gems, for gear under ilevel 600. In Short: Enchant for Crit. In Warlords you can enchant your rings, neck items, cloak, and weapons. All profession enchants (except for Inscription) are gone. No more tailoring cloak enchants or any others. As before, any of the new enchants can be added to your lower level items and will scale down appropriately. Note that Pandarens get twice the food buff (eg: 600 Int from the Stew.). All food buffs last one hour and go away when you die. Your flask is much better than any two of the elixirs, which is why the elixirs are not shown. As with gems, Your Mage bonus adds 5% to any Int bonuses from consumables. As noted above, Int & Crit are the only things you’re interested in. Elixirs: In Warlords there are no elixirs that give stats. Draenic Intellect Flask: 200 Int for one hour. Potions: If you pop one immediately before combat you will be able to pop another during combat. Potion of the Jade Serpent: 456 Int for 25 seconds. Focus Augment Rune: +50 Int for one hour. Occasionally drops from WoD bosses (in Raid Finder mode) and is also rarely found as mission rewards from your Garrison. Stacks with flasks and other buffs. There’s also a similar rune in tanaan, requiring exalted rep. In Warlords almost all of the professions bonuses (cloak enchants, synapse springs, etc.) are dead, so you might be better served by using the professions to build a larger gold stash. The Inscription shoulder enchant remains, but not for gear that’s 600+ and isn’t enough, by itself, to justify getting Inscription. Crafted gear is rather nice. You can make, with Tailoring, Cloth armor at item level 640 and then make the bits to upgrade it to 715. By the way – you can equip this ilevel 715 stuff at level 91. With Inscription you can make a staff and boost it to 705. With either profession you can create items that will let you reroll your stats on the armor and weapon until you get that Crit & Mastery that you want. Creating this gear will require a garrison profession building, daily work orders, and a daily use of your cloth making cooldown. Making the bits to upgrade the armor is quite expensive. Also, you can only equip three pieces of this crafted gear. We suggest Staff, Chest, and Legs. Leatherworking Nothing much here for you. Jewelcrafting Nice gems, rings and neck items, gemmed mounts. Enchanting While you can’t add a special enchant to your own rings anymore, you can now do everyone’s ring enchants. Your follower will let you make illusionary enchants, which are cosmetic changes to other enchants. Inscription Make glyphs, shoulder enchants for everyone, caster weapons, and fortune cards. Alchemy Better living through chemistry. Unfortunately, none explode. Can also transmute things, which is about as close as you will get to transforming lead into gold. Your follower will give you four free potions every day. Engineering has lots of interesting toys, some of which have situational use, and some funky mounts. Also make rockets, shields, and a stealth device, none of which are usable in raids. Your follower will sell you, cheaply, various items including Walter, a bank and repair bot. Skinning Use this to supply leatherworking and to make gold. Herbalism Use this to supply Alchemy and Inscription and to make gold. Mining Use this to supply Blacksmithing and to make gold. In Warlords the Tauren are the only race that cannot become mages. Even the Pandarens can be Mages. All racial abilities that do Hit or Expertise are now dead. Some have been replaced. While no race is wildly better than any other for burnination, some do have certain advantages. Pandarens can be either Alliance or Horde, they choose when they leave their starting area. They can put enemies to sleep (stun) with a touch of the paw, but you don’t want to be in melee range. Still, it can help with escapes. Increased benefits from food buffs will be quite nice while raiding. This will be about 300 Int over what non-Pandaren’s get. Faster leveling due to longer lasting Rest XP. Draenei – Int bonus adds to any damage you do. A minor heal (heal) is always handy for a class that has no heals. Also usable on others. Heroic Presence adds to your Int (and Str & Ag) for more overall damage. Draenei are good with gemcutting. Worgen – +Crit is a DPS add, movement helps. Crit chance increased, which is perfect for you. As is true for Humans, Gnomes have an Escape Artist skill. It’s not as inclusive as the Human skill, but can still get you out of trouble at times. Gnomes have an increased mana pool (mana pool,) which is certainly of interest to any caster. Engineering skill doesn’t help casting, but that skill can help make some nice gadgets which will help. Their Escape ability will have occasional use in PvE and leveling, as well. Diplomacy is nice if you are going to be gaining faction at any point and since so much past level 60 is a faction grind… Warlords of Draenor introduced even more factions to grind favor with. Increased Versatility adds to both your offense and defense. In instances and raids Shadowmeld will drop the aggro you picked up until you unmeld. Hopefully the tank has picked the mob(s) up by then. Quickness is pretty useless in PvE. Faster movement while dead is an interesting perk… Hopefully you don’t have to use it very often. +1% Crit by day and +1% Haste by night. They do not overlap. Dwarves – No DPS abilities. Stone form is nice in PvP and of occasional use PvE. It washes away bleeds and other effects and reduces damage by 10%, which is of some benefit in those “Oh Rats!” situations. Trolls – Berserking and Beast slaying can boost DPS numbers. Berserking increases casting speed by 15% for a few seconds. Very nice, drop it into a macro. Beast Slaying is a nice little bonus for leveling as it adds +25% XP gained from slain beasts. Orcs – Blood Fury is a very nice DPS cooldown. They get the benefit of Blood Fury, a great burst DPS increaser. Put into a macro. 10% resistance to all stuns with Hardiness, useful in PvP situations and helpful in rare PvE content. 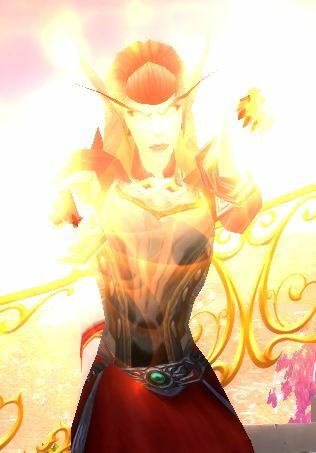 Blood Elves – Now with more crit! Of the Horde races the Blood Elves, are unique in that they have no DPS abilities, as far as Magery is concerned. Their big ability is Arcane Torrent, which can be used to regain some mana and silence nearby casters, though they shouldn’t be nearby anyway. The mana gain is likely to be less useful than it might seem at first glance, due to already high mana recovery. Undead – Small DPS boost from Drain Life. “Will of the Forsaken” can wipe off sleeps, charms, etc., a nice ability to have, especially in PvP. Undead passively use drain life which drains life from opponents and heals you for the same amount. This is a passive effect and happens occasionally with your damaging attacks and actually adds something to your overall DPS. Indefinite Underwater Breathing might have some use somewhere. Goblin – More DPS with Haste. Rocket Jump has definite uses at times, especially as “gain range” ability when Blink is on cooldown. Leveling a Mage or some other class? It’s pretty easy these days, especially with the Warlords of Draenor changes and since Mages excel at destroying things. Still, there are a lot of quests and a incredible number of things to kill. Wouldn’t it be nice to have a bit of expert help in the “where to go and what to do” department? 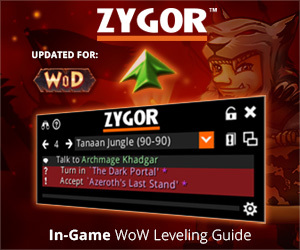 Zygor’s guide gives you that help, whether you”re Horde or Alliance and regardless of your level, at all times. It’s like having an expert showing you exactly where to go and what to do. It doesn’t matter if you stop your questing to gain a few levels in PvP or the dungeons, you’re brand new to the game, or you’re decked head to toe in heirlooms. Come back to the quests and Zygor will figure out where you should be, based on your new level, and update the guide accordingly. It’ll even let you zap your obsolete quests. You’re not even locked into any particular build. Zygor’s guide has a talent advisor which will recommend talents regardless of your class or spec. All in all you’ll blast to 100 faster than ever before. Click here to grab your own copy and quickly blast to the level cap, even is Warlords of Draenor, or read our review, here. Frost PvE – Yes Frost does PvE. Arcane PvP – Yes, Arcane in PvP. You won’t top the Arena charts, but BGs can be fun. I only recall seeing this stat on weapons so far (staffs in particular). It is a shame it cannot be reforged, especially since it is a higher ranking stat. Also I did not see any gems or enchants listed as recommendations for the fire mage to increase spellpower. Do no such gems exist? It may be helpful to note that you can increase your spellpower with a ring enchantment but only if your mage is an enchanter, all the other spellpower enchants do not appear to be as useful as the ones you have recommended. I guess having this stat difficult to increase is part of the challenge of the game. Thank you for your help and all the information this site provides. You’re right, there aren’t any Cata gems or enchants with Spell Power. There were some level 80 items, and when leveling there are some items that add direct fire damage, but none for Cata or M of P. The Ring enchant only adds 23 Spell Power, so the +40 Int enchant is much better (and M of P won’t add Spell Power either.) As far as stats, my Fire Mage (mostly used in PvP) sticks pretty much with Int and Crit, reforging everything into Crit. Make sure you have your Hit taken care of and you’ll be fine. Then in the next paragraph under the stats that explains each one, the spellpower stat is completely left out. The information listed goes from 17% Spell Hit to Critical Strike. The next section is on Reforging. Could you please advise why the spellpower information is not included? Also any information you have to share on the spellpower stat would be greatly appreciated. Good catch. Spell power is pretty much only available on trinkets and weapons these days (and will be in Mists of Pandaria.) You cannot reforge into SP though, which is a shame. I’ll update the page accordingly. Above it says that anything over 15% on hit is useless. So is it 15% or 17%? There is a comment in this thread which refers to 17%, but that’s an old comment. Before M of P is was 17%, now it’s 15% Spell Hit for raid bosses and such, 6% for same level stuff. Any Hit or Expertise on your gear add into the spell hit number, as do certain racials. Draenei Hit, Gnome Sword expertise, etc.